Shelby and many others are "icons" of the automotve field and their contributions are immeasurable. Many like their "exalted position" and do what is necessary to maintain it. Blame some of it on huge egos. If the truth requires a bit of stretching thats not a problem. As more and more time passes stretching the truth becomes a lot easier. The internet also makes it easy. I've never seen anything better than the internet for turning crap into carved in stone fact. Throw in the fact that people are gullible and its all too easy. How they wind up in business is a mystery to me. I guess I don't have much of a head for it. A few years ago I was in LAX waiting for my wife to get in from Ireland. The usual flight delays had me standing around. Another guy was waiting for his wife to get in from Germany. Turns out he was Frank Airhart of Airhart brake fame. We had a long chat and I had to ask him how he got started making brakes. Like so many he got ino the business by accident. P.S. I can understand Shelby's thinking well of himself. He was a racer and a racers job is to beat others. When you start to do that on a regular basis and in major races your ego does grow proportionately. He hasn't raced in yeas but the history is there and he will do his best to keep it current. I hold three land speed records at El Mirage and two at Bonneville. They are in the lower classes but I have noticed that since I have set these records the LSR community treats me somewhat differently. I am no longer the dried up turd on the foor to be kicked out of the way. Nobody bows as I pass by but there is a tangible difference and I'll admit to liking it. Ive never met the guy, probably never will. I keep hearing stories about how Carroll Shelby thinks rather well of him self and likes to distort historical facts about the work done around him to better reflect on himself. Can you shed some light on this? Also, how does one find himself in the position of building cars and professional race cars for that matter such as your self? Well ................. I've known the guy personally and done business with him for over 20 years, I've found him very down to earth and a friendly jovial guy on a personal level. I guess it IS easy to believe your own press and get a bit up yourself from time to time - but as Hoof says, If he can't - then WHO can? I've also learned in my business life that there are several sides to any story - and you rarely get the truth once it's gone beyond 3rd or 4th hand, and I NEVER believe what I read in the press. We [ RAM ] supplied Shelby American with one of our replicas [ ironic or what ! ] fitted with a Caddy Northstar engine that they'd sent over. The whole car was shipped out to SA for evaluation and passed with flying colours. Our own Cobra rep was the ONLY one [ outside Shelby's own ] that had his personal seal of approval, something we're exceptionally proud of. There are a hundred and one stories from that era - but I'll wait until Carroll has passed on to save blushes !!! A gentle story from the Isle of Man. 1970 was my first trip to the Island. I went over with three friends. Growing up here in SoCal I devoured every ariticle I could find on the TT. Articles give you a certain knowledge of the course but nothing can prepare you for the real thing. I was excited and eager to get there. We went up on the mountain for the Junior TT. I don't know exactly where we went as it wasn't one of the spots that was featured in TT reports. It was on a straight section of road and Frank decided this was the spot where we would watch from. There was a low wall about three feet tall. Perfect for sitting and viewing. We had to go about 100 yards from where we were sitting to get the bikes in out of the way. A slight tangent here. At that time (and for all I know even today) hotels would give you a packed lunch if you were spectating. For some reason it was the same thing year after year. A small brown bag that contained an apple, a small bag of potato chips and an alleged pressed tongue sandwich. I say alleged because I don't believe it was pressed tongue. I think it was a piece of linoleum. A fast rider could complete half a lap before you could bite through it to start chewing. And could complete another full lap before you swallowed it! It was useful as a sort of timing device. If you were at Parliament Square in Ramsey and you heard that Mike Hailwood had just started his lap you started gnawing to see if you could get through the pressed tongue/lino and start chewing before he got to Paliament Square. But I digress. We were sitting on the wall waiting for the road closed car to come through when we heard the bark of an open meggaed single coming up the mountain. We all craned to see what was coming. A rider in full racing tuck looking quite stylish rapidly approached. He saw us and suddenly sat up, braked hard and came to a stop right in front of us. It was a very nice racing 7R A.J.S. In a very broad Yorkshire accent he said "Give us a hand lads". We hopped off the wall and quickly lifted the bike over the wall. Being relatively careful not to grab anything hot. He took his helmet off (an old puddin' bowl) and sat down beside us. While we were doing all this we heard the bells of a police car in the distance. The police at the time used alternating bells instead of a siren. Beachcomber will bear me out on this. As the cop car got to us we gave them our best he went thataway and they cheerfully waved back. As soon as they were gone we lifted the 7R back over the wall. He pulled it into gear and back on compression. Then a run and bump start and away he went back the way he came. We never saw him again for the rest of the week. Most stories end there but I was at the TT in '72. I was staying in Ramsey as I left it a bit late and couldn't find a hotel in Douglas. Mad Sunday is a day for the loonies. I've done it a few times but it really isnt for the faint heartd. Especially if you go over the mountain from Ramsey to Douglas. Its so dangerous that the police make it one way from Ramsey to Creg ny Ba. I wandered up to the Ramsey hairpin to watch the parade of bikes. As you all know the Brits drive on the wrong side of the road. Which reminds me. Why did the siamese twins fly from New York to London? So the other one could drive!! That makes the racing line approach to the hairpin on the wrong side of the road. A cop is stationed in the middle of the rod and if you come up to the hairpin on the "racing line" he stops you and gives you an earful and sends you on your way. I have to say here that the Isle of Man cops are the most tolerant bunch of cops I have ever seen. The dumb shittery they put up with during TT week is amazing! There was about 20 of us standing on the outside of the hairpin. Theres a large flat area where you can park and watch. As we were watching the parade of bike we hear the sound of a single on an open megga. We all shuffled to the left to look back down the road towards May Hill to try and see what was coming. Here come a rider tucked in and on the racing line. The cops started waving for him to stop but the rider sat up, hard on the brakes,down through he gears and right around the cop! The cop spun around trying to get the guy to stop. It was the 7R Ajay again!! A big handful of throttle and slipping the clutch he disappeared off up towards the waterworks. About ten seconds later here comes the cops. I was shouting him on and the cop gave me a dirty look and came over to "enquire" if I knew the gentleman on the motorcycle. I had to tell him no but if you couldn't carch him two years before you weren't going to catch him today. I would love to know his name. 230mph?! jesus man, you need to send me a new bag of salt. Bells were the emergency services [ fire, police. ambulance ] means of warning approach, until the mid 60's when sirens started to appear. Initially it caused a lot of concern as WW2 was still imbedded on most folks' minds ! These bells were very easilly removeable [ 1 bolt ] and were the prized collectible of any self respecting hooligan. Well here it is - the "Crispy Daimler Dart" story - hope it lives up to expectations. It'll be the last one for a while, although I have drafted out "Dangerous Roy and the Manx Engine" as it had me in fits just thinking about it! Beachcomber’s Tales from the Day – “The Crispy Daimler Dart”. Here’s the third of the tales and follows on chronologically from the previous “Vanishing Motorcyclist” story. The Lay-Bye racing had become so popular especially in our area, it started attracting the attention of the “Z Car” boys in blue. The term “Z Car” came about from the Police use of the new Mk3 Ford Zodiac, which also spawned a popular T.V. Cop show of the same name - “Z Cars”. The Z cars were introduced to try to catch the London Villians, who took to driving Mk2 Jaguars as getaway cars. They were also the only Police cars of the day capable of getting anywhere near most of the faster motorcycles. This was a time before blanket speed limits, where an unrestricted zone meant exactly that – if you could do 120mph, 130mph, 140mph – no foul. The stretch of Bye-Pass where the Lay-Byes were situated was unrestricted. However, the authorities very sneakily put in a 60 mph limit at the end of the “race” stretch - between Gosnay’s and the next roundabout down. Beyond that was a 3 mile stretch of unrestricted dual carriageway before the “Gallows Corner” roundabout. This was a huge island with 5 roads coming off it. One of the roads was the popular route to the south coast town of Southend – the weekend holiday haunt of Eastenders! When the Z cars were introduced, they used to sit in Gosnay’s yard and wait for some unsuspecting lads who had just been blasting down the unrestricted road and roaring off to get to the big blast up to Gallows corner. 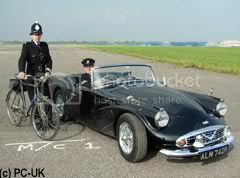 Now then what you DTT boys have to realise is that contrary to popular myth – not many of the current [ 1950’s / 60’s ] Brit bikes would do a genuine ton, so most of the speeders were easy meat for the 100mph Zodiacs. This was before [ !! ] reliable 2 way radios, so it wasn’t a case of calling ahead or reporting the number to a central dispatch for owner recognition. So basically, if you could outrun the rozzers – you got off. 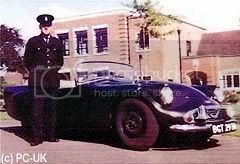 So why the Daimler Dart? Well “our” lay-bye attracted some very fast bikes – it was no good even issuing a challenge for top dog unless you had a genuine 120mph bike. The Darts had a top speed of around 125mph – so theoretically being a match for even the fastest of us. We soon got to know the Police driver crew – and vice versa and before long they fell into a little game. The Darts were soft tops and in the Summer months the cops would pose around with the top down. They’d wait for someone to come howling round the island at Gosnay’s and then they’d take off after them. They’d draw alongside the offender and shout across “ We’re only in third gear, if you can get away from us you get off”. Inevitably most bikes would be nabbed before they got to the next roundabout [ still 60mph limit ]. Anyway the story – matey with the Vincent/Norton lifted the crown from me and my Connie, and yes that Vinnie was mighty quick with Picador cams and an Agaard [?] 5 speed gearbox. The cops knew he was the new “top dog” and wanted to set an example of the guy – and yes his name was Vincent! So, Vincent hurtles past plod in their Dart and gives them 2 fingers as he passes. Now he knew the game about “we’re only in third gear”…..etc. so he deliberately let them catch up with him. “We’re only in third gear”….etc. So Vincent shouts back, “OK, let me change UP to third and see what you’ve got”. With that the Vincent-Norton is off and gone. The boys in the Dart took the real hump with that, and although they’d normally let anyone go who genuinely pulled away from them – they had a point to prove. Eventually Vincent realised he would run out of petrol if he didn’t stop, so decided to pull over. The Dart eventually screeched to a halt by the Vincent-Norton, closely followed by those of us who could just about keep up. By the time the cops pulled in, Vincent had rolled himself a fag and was having a quiet smoke. This infuriated the Dart boys even more – especially as by now they had an audience. They realised they couldn’t book Vincent as we all knew the score and he had not only outrun them – he’d blitzed them. So they decided to give his bike the third degree to try to find some roadworthy violation – which they didn’t. Now then, just in case you’re not aware – Darts were made from fibreglass and in those days it was pretty evil stuff giving off flammable fumes long after the bodies were supposedly “cured”. 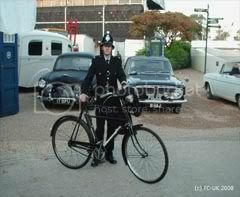 In the pic with the Copper and the bike - the Zodiac is on the right behind him, and on the left is the Ford Anglia - complete with 1098cc side valve engine with 70 mph flat out ! I'm a pig, I'm A dog so exuse me if I drool. so awsome. love these stories.. SO did Vincent get in trouble for blazing the cop car?! Hell no - there were 20 odd "independent and unbiased" witnesses to say it was nothing to do with him !!!! If we tried that stuff today, we would be locked up for who knows how long saying good bye to our rides... Even worse for you Ontario guys!